When do you bless the Lord? Do you just praise His name when things are good? Do you exalt Him when things go your way and according to plan? 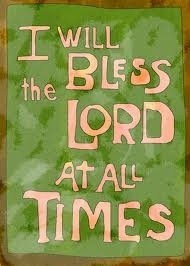 David understood the need to bless (exalt) God at ALL times. In good times and bad times. In desperate times and anxious times. If we only could get that in our head! It is dificult, I admit, when a problem arises to give praise to God, but that is exactly what He wants. Instead of complaining about the problem praise God for who He is, and that He has the infinite power to change whatever problem is in the way for your good. The question is, do you believe God is able? Faith takes you that level where even in the midst of the worst scenario you can bless the Lord. Today even in this bad moment you are going through bless the Lord. You will see His wonderful love and presence cover you and strengthen you to keep on.